Listen to season 2 of Hello from the Magic Tavern Presents: Offices and Bosses only on Stitcher Premium. For a free month of listening, go to stitcherpremium.com/magic and use promo code 'MAGIC'. 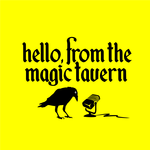 I like the change in scenery, but I wish they hadn't had PFT on the first post-tavern Tavern -- as great as he is as an improviser and an entertainer and a storyteller and a raconteur, he's kind of too big for the show. He just doesn't... I dunno, blend into HFTMT as well as the lesser-known people do. I was way more aware that this was Paul-F.-Tompkins-as-Mr.-Chauncey than I am with virtually anyone else. I wonder if they have a predetermined plot for the space station crew? I desperately want to know what is going on with Craig and what the mysterious man is going to do now... also, I was expecting much more giggling in this episode.